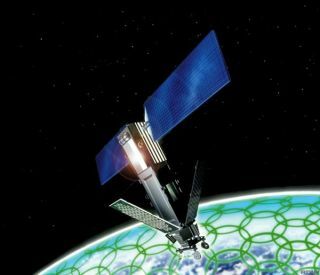 Artist concept of an Iridium satellite orbiting Earth. "I happened to be outside the other night when I caught sight of an ordinary-looking star that suddenly became super-bright. My first thought was that perhaps I was witnessing something akin to a supernova . . . the death of a star." The person goes on to explain how the flare died away seconds later, as quickly and mysteriously as it came. If you have ever seen such a sight, then in all likelihood you've witnessed an "Iridium flare," caused by one in a fleet of satellites that have been put into Earth orbit since the late 1990's; satellites that can briefly appear to flare to incredible brilliance. And you can spot them, too, if you first find out when they're likely to occur. An Iridium communication satellite's Main Mission Antenna is a silver-coated Teflon antenna array that mimics near-perfect mirrors and are angled at 40-degrees away from the axis of the body of the satellites. This can provide a specular (direct) reflection of the Suns disk, periodically causing a dazzling glint of reflected sunlight from their 484 mi (780 km) orbits. At the Earth's surface, the specular reflection is probably less than 50 miles wide, so each flare can only be viewed from a fairly small area. Iridium satellites normally traverse the sky on the edge of visibility, at +6 magnitude. On this astronomer's scale, smaller numbers represent brighter objects. Venus outshines all stars and planets reaching a magnitude of -4.8 at its very brightest. Iridium satellites can provide reflective flares of magnitude -8. That's almost 20 times brighter than Venus, based on how the brightness scale works. The flares can last anywhere from 5 to 20 seconds before the satellite once again becomes almost invisible to the naked eye. In fact, it is even possible to see such flares during the daytime, if you know exactly where to look. If you wish to see such brief flares for yourself, you will first have to know your exact latitude, longitude and local time zone. Then, log on to a web page that will tell you when the next Iridium flares can be seen. One such site is Heavens Above, hosted by the German Aerospace Center. This site and others also provide viewing information for the International Space Station, the Hubble Space Telescope and other satellites. A bit of caution: Not all Iridiums flare according to the predicted schedules. Some of the Iridium satellites are either tumbling or otherwise not operational so their future movements cannot be reliably predicted. A fully operational satellite should be orbiting the Earth at 14.34 revolutions per day. You may wonder why are the satellites called "Iridium?" It has absolutely nothing to do with the metallic element that occurs in platinum ores. Originally, it was conceived that a total of 77 Iridium communication satellites would be placed into Earth orbit. Since the atomic number for Iridium is 77, a satellite constellation's name was conceived. In reality, a total of 88 satellites were launched between May 5, 1997 and June 11, 1999. An additional five more were launched on February 11, 2002. Typically, the expected lifetime of a satellite is 5 to 8 years.